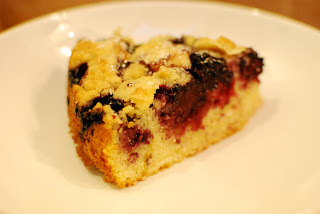 Oooh, I am loving the blackberry crumble cake. 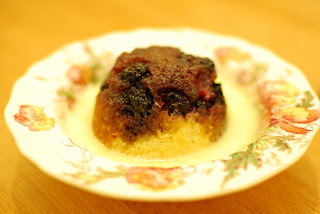 Me and my brood have been out 3 times to pick now and I have more than enough jam so tomorrow I shall be making this! Thanks!! Christine Mosler - 3 times and enough homemade jam? I salute you! I'd love to know how you get on with the cake, and thanks for the link. Love the look of that crumble cake. I've pureed a few kilos of blackberries, currently frozen waiting to be made into jam, and want to bottle some more. Hope the weather allows this as it is best to pick them on dry sunny days then they are less likely to go mouldy. Who couldn't be inspired by your recipes? looks lush. how come you didn't just sterilise them in the oven or is that a silly question? My big tip would be to sterilise your jars in the oven instead... Soooo much easier. I put my open jars onto a large baking tray, put into a cold oven and set to 100 degrees, and leave for about half an hour. If your oven is slow to heat, leave for 20 minutes after the light comes on to tell you it's reached temperature. That just leaves the lids to boil in a small saucepan and air dry on a clean teatowel. When the jam is ready, I take the jars out and spoon the jam in directly into the hot, sterilised jars. Use an oven glove to get the lid on fast to get a seal whilst it's hot. I love jam making and make several lots a year. Like Kavey I have taken to sterilising my jars in the oven. 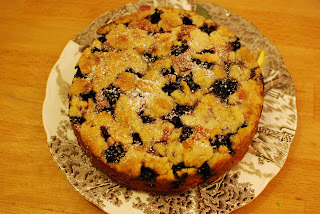 Love the look of the crumble cake - I'll be trying it soon. I reckon the trick is to continually have a small ladder strapped to your back at this time of year. Your eco-warriors never think of that, do they? Fab looking recipe from E. Shall try that. Wow. The crumble cake looks amazing. No pain no gain! 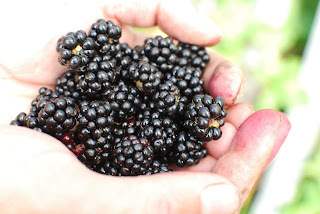 I know the pain of Blackberry picking all to well, as a kid we'd go off on long walks to find them for puddings and stuff. I know now that we were only took along as our small stature and little hands could get the really ripe ones that my Dad was too big to get. Traumatised I am! Great work Dan you have inspired me - but am I willing to risk life and limb for jam I wonder? Gloria - Thanks for the comment! Will - Thanks mate. Well, short answer is we started making the jam before realising we hadn't sterilised the jars. Quickest way seemed to be boil 10 mins, and then 10 mins drying in the oven. Seemed like a good idea at the time! Interesting that the hot wash in hot soapy water and then in hot water works fine, all of the recipes I've read seem so strict on it. Perhaps we were being too cautious. Kavey - Great tips, thanks. You're obviously a much more veteran jam maker than me!! George - Thanks very much. lialeendertz - I did comment at the time upon our lack of a small ladder, next time we will be more prepared! Eat Pictures - Blackberry cupcakes look cracking, and signifigantly less dangerous to make than jam. Pavel - I'm now traumatised too from reading your account, but bet it feels good to let the pain out....weight lifted from your shoulders mate? 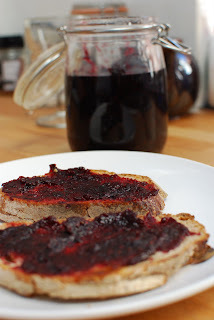 GC - Glad to have inspired you :) - always worth risking life and limb for jam, makes it taste better. That cake looks lush!! And good question, how DO those dear old biddies manage it?! Gastrogeek - Ta very much Rej - Elly is a wicked cake maker. I know, honestly making jam is probably the most dangerous kitchen exercise known to man. I need to shadow an OAP jam-maker and see what the secret is.